Money in the Garage: Downsize and make money ! Downsize and make money ! January could be one of the slowest times of year to sell on eBay. People are tapped out from their holiday buying binge and aren’t in the mood to spend. But sales eventually pick up as the weeks go by. In the meantime, there's plenty of things I could be doing here at Money in the Garage. For one thing, my work area is still a mess from preparing holiday packages to ship out. There’s also a ton of empty boxes that need to be stacked away, along with other general housekeeping. On the other hand, I can get to cleaning up later. It’s a lot more fun to head out to the thrift shops to find fresh inventory! Starting off with the small stuff, here’s a 15 year old Casio watch that sat in my dresser drawer for many years. This watch tells the temperature, altitude, barometric pressure and oh yeah, it tells time too! Being an excellent packrat, I still had the original box and manual. I stopped wearing the watch about ten years ago for the same reason many other folks abandoned their wrist watch....cell phones. To me, wearing a watch is now something out of Fred Flintstone! Think about it; who really needs to strap a miniature clock on their wrist when their cell phone performs the same function? But even though it’s an antiquated concept, I found that some people still want to wear a timepiece. I sold my little Casio on eBay for $22 bucks. Not great money, but it’s all about trying to clean house. I’d point out this meager sale doesn’t mean all Casios sell for only a few bucks. 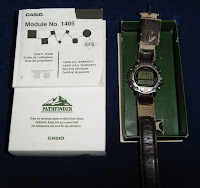 Vintage Casio watches that feature multiple techy-type functions can sell for huge money on eBay. 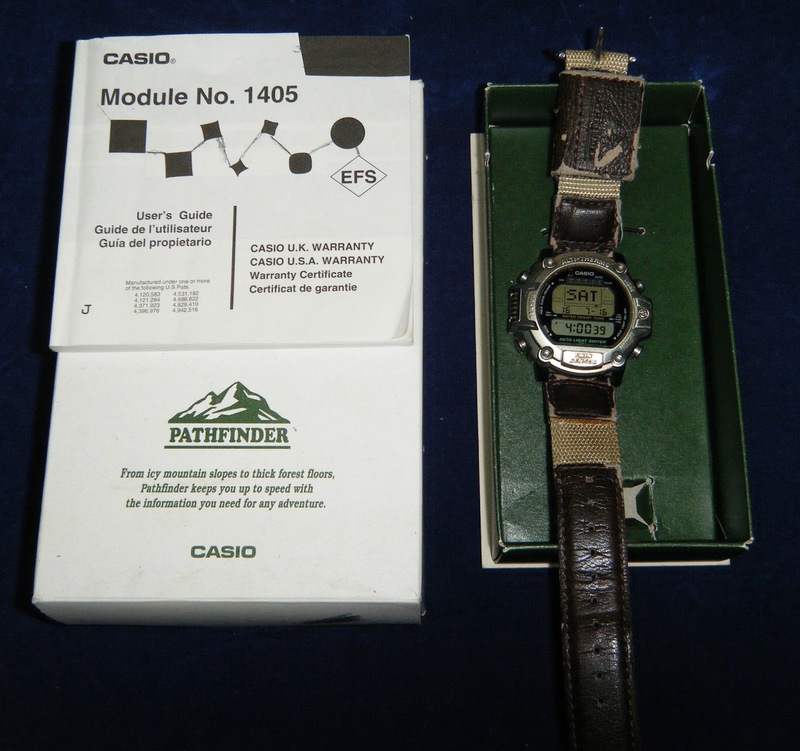 So even though I didn’t make a whole lot on my own Casio, I'll still keep an eye out for them at thrift stores and garage sales. 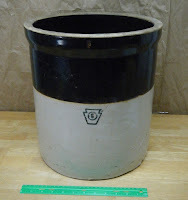 Another dust collector I had sitting around the house was this old, primitive stool. I bought this little guy many years ago at a yard sale. For a few years, it sat next to the fireplace looking very shabby chic. The stool was so beat up and worn, that I remember my Mom asking me why I even bought the thing? Like most people who grew up during the Great Depression, my Mom couldn’t understand why a person would purposely buy something so ratty looking and put it in their house? (She’d had that same opinion upon seeing her granddaughter wearing “distressed" jeans with holes in them!) But despite Mom's disapproval, I thought the the beat-up, old stool looked pretty cool by the fireplace. After a few years, however, we decided to clear some space around the fireplace, so the stool was relegated to a basement shelf. 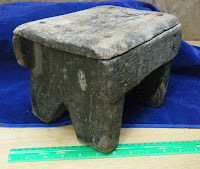 But recently, I eyeballed the stool as a potential sale on eBay. There remains a healthy market for "shabby chic” stuff, plus the stool was small enough that I could easily mail it. I posted the stool on eBay and it sold for $25 dollars. More space had been cleared off my shelf and I made a few bucks too! heavy. This one was no exception. I could visualize my poor Father complaining under his breath as he lugged it through the flea market and back to his Chevy Impala. In all honesty. I am not sure why my Mom really needed a crock? Once it was home, it seemed like it's sole purpose in life was storing a couple of Bell Telephone phonebooks! I guess it was the best use for it at the time, but when I took possession of it, phonebooks were a thing of the past. Instead, it sat empty and unused in my basement for several years. Realizing the old crock was just an albatross that I had no use for, I decided to sell it. Because it was so heavy, I used Craigslist instead of eBay, listing it for $40 dollars. A few days later, an older gentleman took an interest in the crock and drove to my house to check it out. After looking it over, he hemmed and hawed on the price. I didn’t want to get stuck carrying the albatross back inside the house, so I quickly dropped the price down to $30 dollars. At that, he agreed and the crock went to a new home! Remember music CDs? I sure do and over time, accumulated a ton of them. The problem is, like many people, I no longer play them. Nowadays, if you want to hear your favorite music you have easier options like iTunes, Pandora and Spotify. I am not sure if CDs are even sold in stores any more? Likewise, trying to sell them on eBay is becoming harder and harder. Frankly, unless you have something really good like the Beatles or similar, you may be stuck with your CDs. But all is not totally lost on unloading these dust collectors. I found there can be a brief selling opportunity for holiday CDs during the Christmas season. For example, I lumped together about a dozen holiday discs and sold them on eBay for $15 bucks. That was just over a dollar a disc. Not a windfall, but once again, gone from my house which was my real objective anyway. While that sale was nothing special, I did hit a home run with another collection. I discovered that buyers are still interested in the Time-Life "Treasury of Christmas” collection. 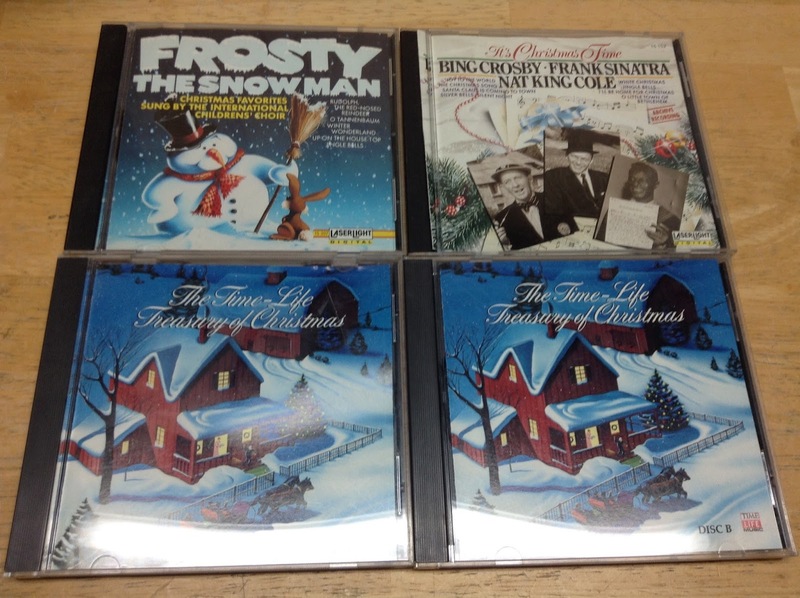 This popular holiday set was originally sold in vinyl, then transitioned into a CD collection. Back in the day, you could not avoid seeing the Time-Life Treasury of Christmas commercial on television. It was on constantly! The collection was very popular and is now considered a classic. I sold my set on eBay for $26 dollars! (Along with two other CDs I threw in just to get rid of them.) Considering they’re old CDs, I was pretty impressed with that sale. Enough so that I won’t hesitate to buy the Time-Life collection if I ever spot it a future garage sale! That's just a few examples of my downsizing attempts so far. Have you sold any good stuff you had laying around the house? How’d you do? Share your story in the moment section below! Preparing to move to a smaller place is a BIG job. You have to reconsider everything you own and decide if it's worth keeping and/or if you'll have room for it in the new location. We started about 3 years before we planned to move. We had yard sales, did flea markets, sold online, donated and gave away so much stuff, yet we still had plenty left to fill a 1200 sq ft cottage. That place ended up being way too small, so we moved again and now have about 1700 sq ft which is just about right. I continue to declutter and keep things simple to make life and upkeep easier for us. Funny, I remember having a couple of big crocks too. They were nice, but not very useful. lol. Good luck to you and Mrs. Dude! Lorraine - I remember following your move on your blog, Actually was pretty interesting to read your weekly adventures-ha! The space issue is key, right? We were at a community yard sale in a 55 plus neighborhood and I spoke to a guy who had just moved in. He had the same problem-brought too much stuff with him for the smaller house. We’re looking at hopefully a two year timeline to par down our stuff. I have to admit though, I need to put my nose to the grindstone and take it seriously. So far, it's been a slo-go. Thanks for the good advice....Dude! Last summer I sold a 24 piece IKEA Rondo crockery set that I had found in the trash years ago and wanted to keep for myself but ended up not using. I'm back to a limited amount of mismatching plates and bowls and it's all I need. Happy with the space back in my cupboards and EUR 40 in cash! Le-Chat, A trash find turned into $40 is awesome! You also kind of jogged my memory on the plates and bowls. I have my Mom’s soup tureen sitting in a box too. I don’t think theres much of a market for that, but it may show up in my blog down the road-HA! You're inspiring me. Time to go through the CDs I never listen to anymore. Carol- Absolutely! I hope you have some winners in your collection.